Bananas are so delicious and nutritious. That’s why many people like to include bananas in salads, desserts and so on. How do you usually cut a banana? Using a knife? While this is ok if you are just slicing one banana, it will be tedious and time-consuming if you have to cut up a lot of bananas to prepare a big meal for lots of people. Fortunately, there are always brilliant tips and tricks out there to make our life easier. 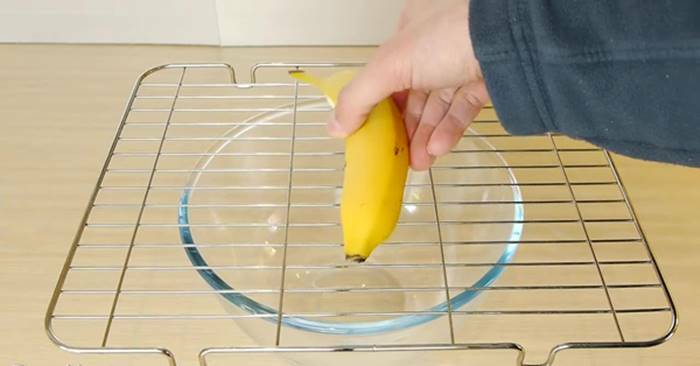 In this tutorial, YouTube channel DaveHax is going to show us a fun and smart way to cut a banana using a household item you may not have thought of: the cooling rack grill! With this ingenious technique, you’ll be able to slice lots of bananas in a fraction of time. And you can work with kids on that because this is fun and safer than using a knife. This technique also works for cutting soft fruits such as avocados. Follow the video and learn how to do it. Let’s get creative in the kitchen! Are you going to give this a try? Please share this fantastic banana life hack with your friends and family!